Peter is thrilled to share two recent experiences where events unfolded in just this way. The first came when Peter was invited in September to equip and encourage a local church in concepts of disciple-making. In the training session, he taught them three key components. Simply put: meet someone and offer to pray for them; share a story from the Bible about Jesus with them; and then invite the person to a Discovery Bible Study. As part of the training, the attendees went out on the streets in pairs, to put things into practice. Peter and local believer Lulzim* were walking through a nearby park and got chatting to a young man. His name was Artan*. When the other two men offered to pray for him, he accepted gratefully. As Lulzim and Peter finished praying, Artan commented, "That was amazing. I felt like this power and energy and peace in me, sort of shooting up from my legs and filling my whole body." When the others asked if they could share with him how he could know God for himself, Artan was keen to hear more and explained the reason: “Everything I've been taught about God is that He's really distant and doesn't like us very much. But I felt there must be something more, so I've found some Christian stuff online." On the other occasion, Peter and his friend Qendrim* had driven out to pray in the mountainous border region of Kosovo and Albania, in an area inhabited by an unreached people group that OM Kosovo is starting work with. After a couple of blocked roads led to long detours, the fuel warning light came on. “Not what you want to see up in the mountains!” comments Peter with a smile. Pulling into a local village, he and Qendrim prayed they'd find not only fuel, but also spiritually open people. The first guy they asked about fuel declared, "I'm your man!" His name was Agron*, and he offered to run and fetch some diesel, or for Peter and Qendrim to even stay the night if they needed to. Agron took them to a cafe along with some of his friends. In no time at all, Qendrim and Peter were sitting round with a table full of local guys, laughing and drinking coffee. As the coffee flowed, Peter reflected on how very similar this all felt to the opening verses of Luke chapter 10, where Jesus sends His disciples out to every place He was about to go: Jesus sent them out two by two, like Peter and Qendrim were (Luke 10:1). Jesus sent the disciples without much ‘stuff’ (Luke 10:4) so that they'd be dependent on God, and on local help and resources, which in the New Testament context meant they shouldn't take a bag or sandals. “In our case we were low on diesel,” recounts Peter. Luke 10:8 says to eat whatever is put in front of you, so Peter and Qendrim followed Agron to the cafe, where Agron bought everyone a coffee. “It's the first coffee I've had that was so thick that I literally had to chew it,” laughs Peter. Luke 10:9 says "heal the sick," so Peter and Qendrim next offered to pray a prayer of blessing on the village, and the people. One of Agron’s friends had kidney problems, so they offered to pray for him, and for others who were out of work. “So we just sat there in the cafe, and had a little prayer meeting, after which everyone said a resounding Amen!” says Peter. Luke 10:9 also says to proclaim that the kingdom is near, so the friends shared some stories about Jesus from the Bible and invited the others to discuss them. When it was time to go, Agron swapped phone numbers with Peter and Qendrim, who promised to return and are praying that Agron will be part of a new community of Jesus followers in that village. “It made me think”, says Peter,” that if Luke 10:4 was written today, Jesus might have said, ‘Do not take a purse or bag or sandals, and only take half a tank of diesel!’"
Pray for the OM team as they walk alongside Kosovar churches in their disciple making. Pray for God to prepare people of peace, who are ready to hear the gospel. 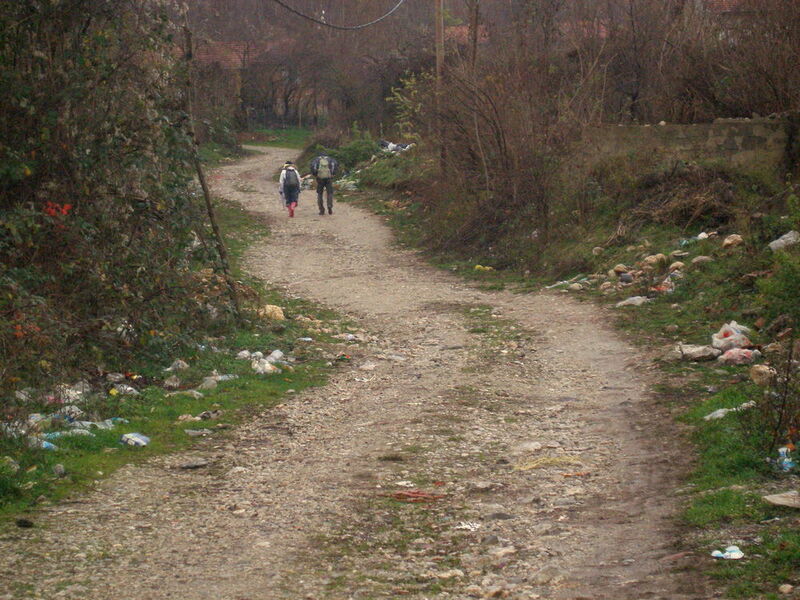 Pray for church planting teams to live among the least reached groups in Kosovo.